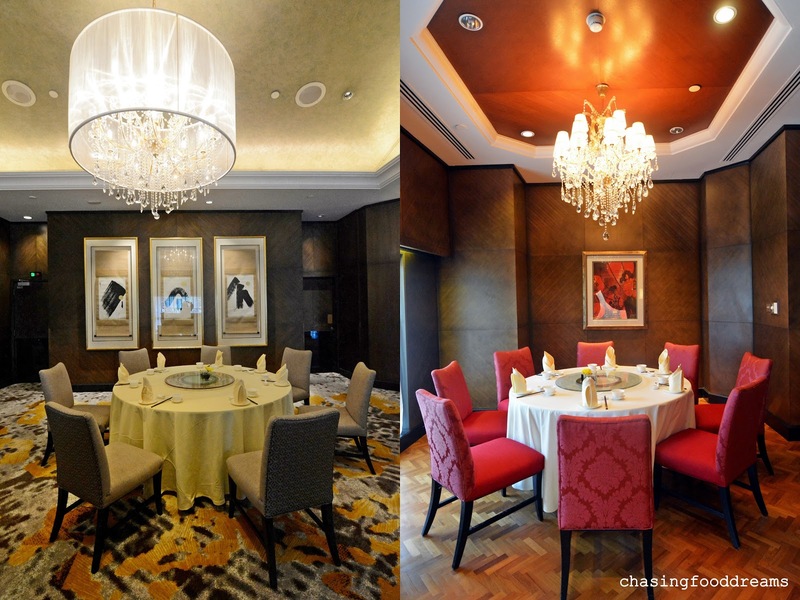 A new Celestial Court commands a new dining experience with a Chinese feast fit for royalty. Celestial Court has been serving Cantonese cuisine at Sheraton Imperial Kuala Lumpur Hotel since it first opened in 1996. The award-winning Chinese restaurant has recently undergone a face lift in the month of June 2018. An opulent interior of plush cream, gold and dark wood sets the mood of elegance and fine pleasures of a sensory dining experience. The main dining area, graced with crystal chandeliers, is beautifully spacious and set with comfort dining in mind. Private rooms are also available, decorated with the same theme of colours and grandeur. Helming the refreshed Celestial Court are Cantonese Chef Ho Boon and Dim Sum Chef Ken Liew together with the culinary team that is responsible for the scrumptious creations of Celestial Court’s new menu. With the many culinary experiences from both chefs, diners can expect an exquisite list of Chinese dishes as well as delectable dim sums of imperial standards. Dim sum has always been a constant favorite with foodies. Celestial Court’s new dim sum menu is simply gorgeous at sight, offering plenty of classic and creative choices for a delightful dim sum experience. The Signature Prawn and Chicken Siew Mai is well-made with the essential plump and juicy meat dumpling textures. Seasoned well, the siew mai is finished with ebiko and asparagus. Another new dim sum to look out for is the Seafood and Black Garlic Dumpling Topped with Savory Unagi. The balanced of unagi and seafood mousse with hints of subtle sweetness of black garlic is sublime. The Beet Root Crystal Vegetarian Morel Mushroom Dumpling with Truffle Oil Essence is lusciously aromatic. Heady with generous truffle aroma and essence, the vegetarian dim sum has a chewy tint of pretty fuchsia from beetroot. It is filled with chopped mushrooms and other vegetables that contribute to the textural part of the dumpling as well as a delicate fresh taste. Besides the steamed dim sum, diners can also enjoy the Prawn Paste Ball with Bitter Gourd in Salted Egg Yolk and Pumpkin Sauce. Large king prawn balls lusciously coated with the much-beloved salted egg yolk is a sure crowd pleaser. The skillful chef even cleverly incorporates bitter gourd and pumpkin into the sauce without much of a fuss since its deliciously subtle. The Golden Fried Smoked Salmon Kataifi Roll with Seafood Mousse and Avocado served with Mix Fruit Salad is another creative twist to the dim sum menu. Not often used in Chinese cuisine, kataifi is middle eastern shredded phyllo pastry. The roll has a delicious seafood filling that is jazzed up with a creamy sauce and fresh sweet fruits as well as generous dollops of ebiko. There are plenty of dim sum on the menu to try such as Imperial Sea Treasure Dumpling with Abalone, Sun Dried Scallop in Superior Chicken Consommé, Cabbage and Beancurd Sheet Roll with Sea Cucumber in Conpoy Sauce, Poached Szechuan Crab Meat Dumpling with Spicy Chili Soy Dip, Oat Coated Prawn and Banana Roll served with Wasabi Mayo and more. Moving on to the Chinese a la carte menu, the Signature Hong Kong Style Roasted Duck with Five Spice makes a guaranteed dish to impressive at sight. A signature of Celestial Court, the gorgeous duck has such a rich and glistening lacquered on the skin. The crisp skin is wondrously addictive while the meat is deliciously succulent, so much so that each bite into the piece of duck yields much satisfaction. A must order as the duck is so good on its own that no sauces or condiments are required! The Deep Fried Grouper Fillet with Lime Chili Dressing has thick pieces of grouper fillet, thinly battered and fried. Dressed with a piquant citrusy lime and chili dressing, it is also finished with textural components of thinly sliced raw onions, lime and coriander. The vegetarian option of Braised Bamboo Pith with Mushroom and Asparagus is a dish that is easy to enjoy. Chockful of sweetness from crisp asparagus, earthy soft mushrooms and tender bamboo pith with nutritious goji berries, the dish has one savoring the natural sweetness that is good for us. Finish your meal with a fruity sweet note of Cream of Mango with Vanilla Ice Cream Pomelo, Pearl Sago & Almond Flakes! The snacks here had a smooth taste with a bit of cheese and lime juice. To start, we got pork rinds at event space Chicago here; they were really flavorful with a spicy kick and smooth taste. Plus, it was a large fresh bag too, place is worth the price.